Q. What is the true meaning of this ancient emblem? A. The ladder of seven rounds, says the London "Freemason's Magazine," has been a symbol in many ages and countries. This planetary signification given to the seven rounds of the ladder, as stated by the writer of the above, is in perfect harmony with the religious ideas of the ancients who worshipped the sun and planets, and the several allegorical legends which they founded upon the facts of astronomical science. Near the site of ancient Babylon are the ruins of the great Temple of the Seven Spheres, which for a long time was thought to identical with the great Temple of Belus, described by Herodotus, situated in Babylon, and which it closely, though not exactly resembles. The builder of this temple is unknown, and the date of its original structure is also uncertain. It was, however, restored and carefully renovated by Nebuchadnezzar, whose name is still legible on the bricks and cylinders deposited at the angles. The account which the royal restorer gives of his work has been likewise found on the inscriptions among the ruins. The following particulars as to this great temple, which is a type of the plan and character of all the Babylonian sacred buildings, is taken from Rawlinson's Appendix to Book III of Herodotus. The ruins were carefully and completely explored by Sir H. Rawlinson himself but a few years ago. Like the great Temple of Belus at Babylon, as described by Herodotus, the Temple of the Seven Spheres was a building of seven receding stages. At the top of the seventh stage was placed the ark, or tabernacle, which seems to have been fifteen feet high. The ornamentation of the building was almost solely by color. The seven stages were colored so as to represent the seven planetary spheres, according to the tints regarded by the Sabaens as appropriate to the seven luminaries, the basement being black, the hue assigned to Saturn; the next an orange, the hue of Jupiter; the third a bright red, the hue of Mars; the fourth a golden hue of the Sun; the fifth a pale yellow, the hue of Venus; the sixth dark blue, the hue of Mercury; the seventh silver, the hue of the Moon. 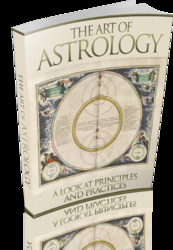 The sciences of astronomy and astrology will, therefore, no doubt furnish the key to the symbolism of not only the seven stage of the temple, but the seven rounds of the ladder also. In truth, the reference in both to the seven planets points us earnestly in that direction. The sun on the 21st of December is at his lowest point of declination below the equator, and the days are the darkest and the nights the longest, while all nature lies dead, locked in the arms of winter. On the 21st of March the sun reaches the vernal equinox. Spring begins, and nature revives from the death of winter. On the 21st of June the sun reaches the summer solstice, when the days are the longest, and the sun seems for the first time to have regained all his former power and glory. Now, it will be observed, by looking at any celestial globe, that the progress of the sun from its lowest to its highest declination is divided into seven equal parts by the seven signs of the zodiac, through which he passes, or in which he is, while mounting upward from the winter to the summer sol stice. The sun, starting in Capricornus, passes successively through Aquarius, Pisces, Aries, Taurus, and Gemini, until he reaches the summer solstice, or summit of the zodiacal arch, on the 21st of June. If the reader will take the trouble to trace this ascending path of the sun along the ecliptic on a celestial globe, its symbolical significance will be impressively illustrated. It must, however, be remembered that the winter and summer solstice were anciently in Aquarius and Leo, and not in Capricornus and Cancer, as they now are, owing to the precession of the equinoxes. The Hindu astronomer, Varaha, says, "Certainly the southern solstice was once in the middle of Asleha (Leo), and the northern in Dhanishta (Aquarius)." Modern astronomers all declare the same thing. A study of the various astronomical myths of antiquity shows that the most of them originated when the summer solstice was either in Leo or between Leo and Cancer. In the days, therefore, when planetary worship had its rise, the sun, in his passage from the winter to the summer solstice, started in Aquarius and ascended successively through the signs Pisces, Aries, Taurus, Gemini, and Cancer, 30° each, and entered Leo at the summit of the zodiacal arch on the 21st of June. These seven signs are therefore symbolical of seven ascending stages or steps, and, according to the science of astrology, these seven signs, following each other in this exact order, are the houses of the seven planets (which they rule and signify) in exactly this order: Saturn, Jupiter, Mars, Venus, Mercury, the Moon, and the Sun. But by a strange correspondence this is the exact order in which the planets are arranged as ruling the seven ascending stages of the Temple of the Seven Spheres, with but one exception. The moon, whose house is Cancer, and which sign she rules (according to astrology), is at the top of the seven stages, while the sun is placed in the center, between Mars and Venus, who rule the vernal signs Aries and Taurus. This is, however, in perfect harmony with the ancient allegory above given, for anciently the vernal equinox was between Aries and Taurus, the summer solstice being between Leo and Cancer. The base of the temple, therefore, symbolized the winter solstice—the appropriate color of which was black, and its signif-icator Saturn or Time, which destroys all things. It referred to the sun at his lowest point of declination, and when Nature is desolate and dead. The central stage, ruled by the sign Aries and Taurus, between which the sun was emblematically represented by his color, was typical of that luminary raised to life again at the vernal equinox, when the sun entered those signs in the spring. The seventh stage, or summit of the temple, was in like manner typical of the summer solstice, anciently between Cancer and Leo. Cancer is ruled by the moon, and Leo is the sole house of the sun (according to the teaching of astrology). other recent writer, who had no idea of its true meaning or ancient origin.